The following article describes how to configure ShoWorks in a Remote Desktop (formerly called "Terminal Services" prior to the release of Windows Server 2008) configuration in order to improve performance (speed and stability), especially for larger fairs and or those with long distances between the data and other computers. Technical assistance in the initial setup of Remote Desktop is outside of the scope of this article. Please contact your network administrator or person responsible for maintaining your computer network for such assistance. 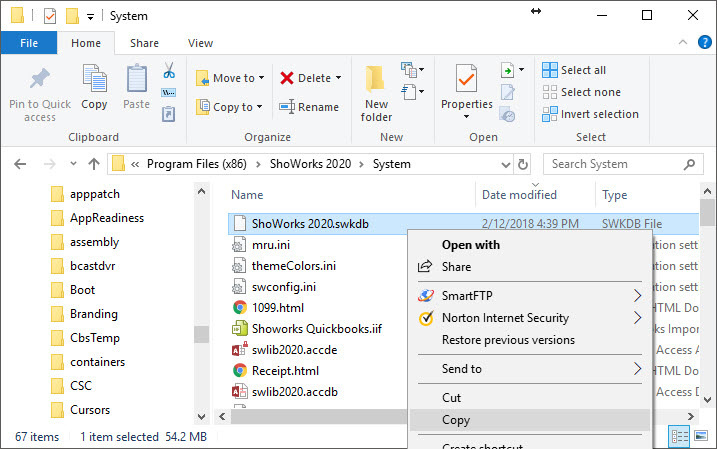 By default, ShoWorks uses a file-sharing method to use across multiple computers over a network. For smaller fairs, this is adequate and the simplest configuration since it entails only installing ShoWorks on all needed computers, and then each computer opening the same data file located on some shared location. See help article 115002 for more information on this setup. Another alternative for using ShoWorks among multiple users simultaneously is to use a Remote Desktop configuration. Speed is dramatically increased (lag is almost eliminated), and stability allows for even the slowest network or Internet connections (even from long distances across the globe). ShoWorks on a Remote Desktop setting may not require any configuration either if all users will not need to create or edit custom reports. However, this is probably not the case and thus a few steps need to be taken to ensure that all users can create and edit their own custom reports. You must be able to see the ALL file extensions (.swkdb, .accdb, etc). 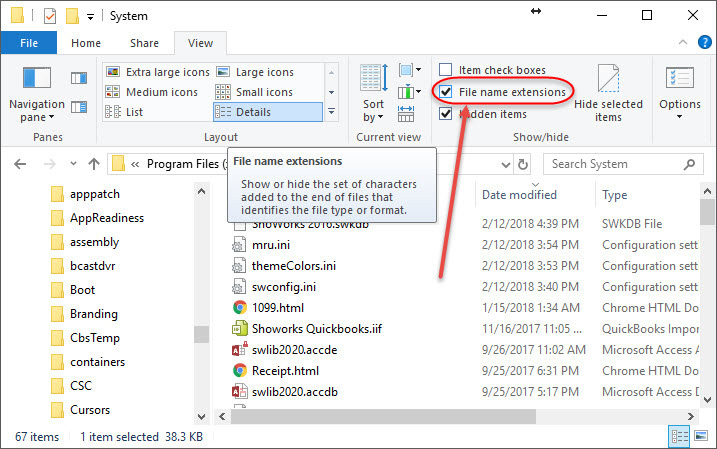 If you cannot see all file extensions in Windows 10, choose the View tab, then place a check in the box 'File name extensions'. Windows 7 users must press the Alt key to bring up the menubar and select Tools>>Folder Options..>>View then uncheck the box that reads "Hide extensions for known file types. 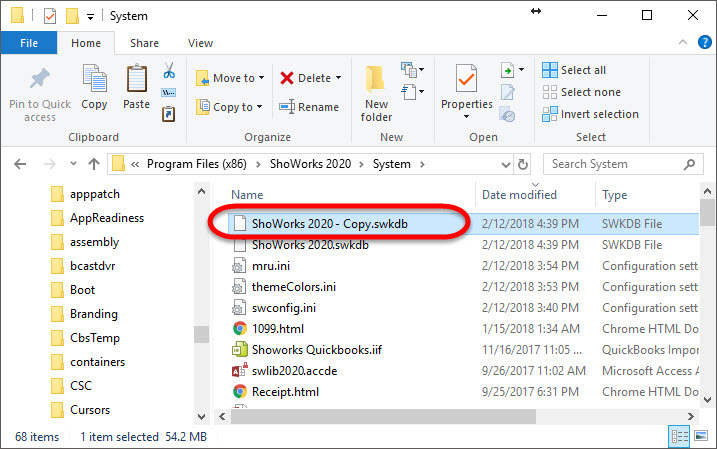 Locate the file ShoWorks 2016.swkdb and copy this file by right-clicking and selecting Copy, then pasting immediately (right-click Paste). 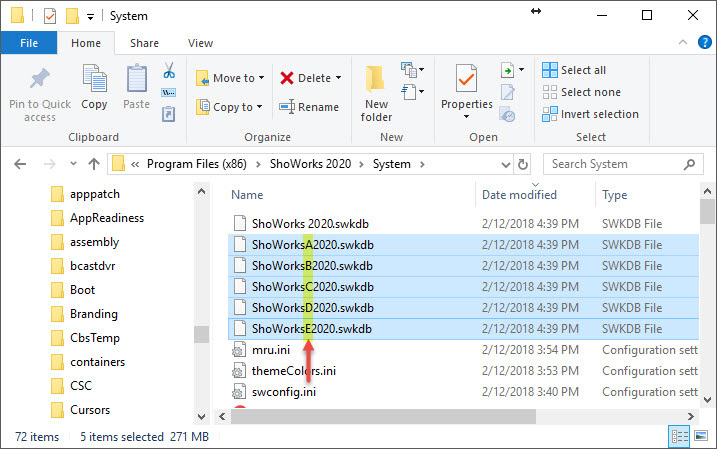 Rename the new file from ShoWorks 2016.swkdb to ShoWorksA2016.swkdb Notice that we have simply replaced the space between the word ShoWorks and the word 2016 with a letter "A". Repeat steps 3 and 4 for the number of different users that will be using Remote Desktop. Such as ShoWorksB2016.swkdb, ShoWorksC2016.swkdb, etc. It is important to keep the same number of characters (19) in the file name. Create desktop shortcuts for these new files and make them accessible to the different users of your Remote Desktop setup. Users will now be using ShoWorks in their own program file environment, able to create and edit reports. To avoid confusion with the original ShoWorks file, you should hide or delete the original desktop icon.